The fifth Best Picture nominee was the small, less splashy psychological drama or "women's picture," Paul Newman's directorial debut film in an independent production, Rachel, Rachel, with his wife Joanne Woodward in the lead role as a Connecticut small-town sexually-repressed schoolteacher/spinster. One of the biggest surprises of the year (and Oscar history) was Cliff Robertson's (with his sole career nomination - and only Oscar) Oscar win in the Best Actor category for his role in the profound 'sleeper' film, Charly (the film's sole nomination) - adapted from a short story titled Flowers For Algernon by Daniel Keyes. The award-winning actor portrayed Charly Gordon - a mentally-retarded, thirty year-old bakery worker who was suddenly (but temporarily) transformed (as in the Pygmalion stories) into a genius by radical, experimental brain surgery and then tragically regressed. In the Best Supporting Actor category, Jack Albertson (with his sole career nomination) won as Patricia Neal's frustrated husband Jack Cleary, the father of returning World War II veteran Timmy (Martin Sheen) in The Subject Was Roses. He was reprising his role (as was Sheen) from the Pulitzer Prize-winning 1964 play. 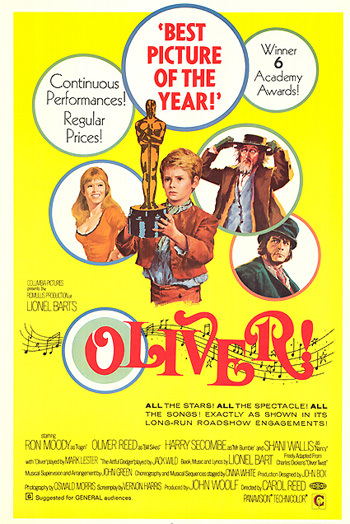 fifteen year-old Jack Wild (with his sole nomination) as the Artful Dodger in Oliver! Aging, seventy-two year-old versatile actress Ruth Gordon (with her second and last career nomination - and her sole Oscar win) took the Best Supporting Actress award for her eccentric role as Minnie Castevet, one of Rosemary's eccentric, devil-worshipping, next-door neighbors who promotes Mia Farrow's delivery of Satan's son in director Roman Polanski's first American film, Rosemary's Baby (with two nominations and one win - Best Supporting Actress). 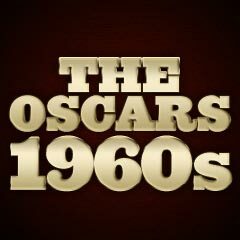 The films that didn't receive major nominations in 1968 are now considered the films that uniquely defined their times. For example, writer/director Stanley Kubrick's great revolutionary science fiction masterpiece, 2001: A Space Odyssey (1968) was not nominated for Best Picture and received only one award - Best Special Visual Effects - from its four nominations (other nominations were Best Original Story and Screenplay, Best Art Direction/Set Decoration, and Best Director!). The Academy members presumably didn't recognize or realize the outstandingly superior, too-believable makeup in the opening scenes of 2001, that included both human actors with life-like masks and infant chimpanzees! The title roles in two cop films were un-nominated: Steve McQueen as a San Francisco homicide detective in Peter Yates' Bullitt, and Richard Widmark as Detective Daniel Madigan in Don Siegel's Madigan. And Tuesday Weld's performance was likewise un-nominated - as a pretty, calculating, amoral killer Sue Ann Stepanek in Noel Black's low-budget black comedy-thriller Pretty Poison (with no nominations), with co-stars Anthony Perkins as an unstable, recently paroled lumber company worker, and Beverly Garland as her strict mother. Eli Wallach was also unrecognized for his performance as Tuco - a Mexican bandit in Sergio Leone's definitive, violent 'spaghetti' Western The Good, the Bad, and the Ugly (with no nominations). The memorable musical score by Ennio Morricone was also bypassed. Finally, Nino Rota's recognizable and popular score for Romeo and Juliet was also not nominated. And there was no nomination for Zero Mostel's Max Bialystock (arguably his best-known role) in The Producers.